In 1870 Alexander Leslie Melville, a banker, resident a Branston Hall, decided to provide water supply for the Hall and also for his partner, Eustace Abel Smith, residing at the Longhills Hall on Sleaford Road. They called upon the expertise of Mr. C. L. Hett of the Ancholme foundry in Brigg, and who had a reputation nationally for designing water pumps actuated by water power. A sluice was built upstream on the beck to form a good head of water which was gravity fed through clay pipes to discharge over the top of the 10 foot diameter wheel. 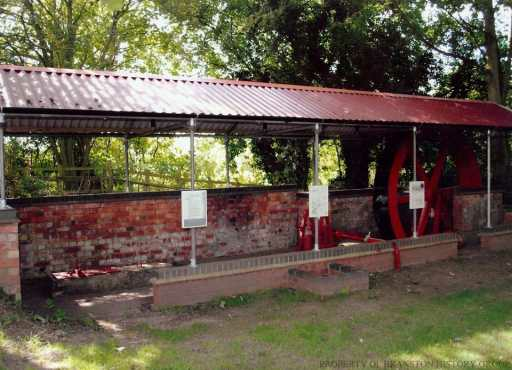 Fresh clean water, piped from a nearby spring, was stored in a semi-underground cistern adjacent to the wheel, and the turning wheel drove a pump to deliver this to the Hall and the Longhills. The supply pipe to the Longhills ran through the land owned by Henry Grimes at Springfields and then across the to the windmill, on Sleafor Road, owned by Charles Sampson Dickinson of Ashfield House, crossing the road to Abel Smithâs residence. Mr. Grimes and Mr. Dickinson also had water from this main. The water supply was successfully in use by 1879 and ran continuously until 1897. 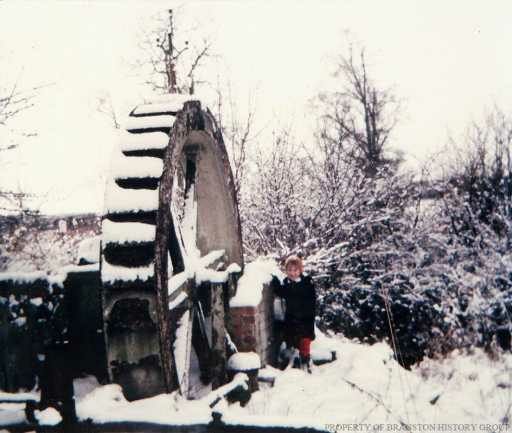 By this time the households being supplies had grown considerably and the supply was inadequate so it was decided to replace the wheel by a more reliable source of energy to drive the pump. An engine powered by gas was installed, a steel pipeline having been laid from the gasworks in Rectory Lane. 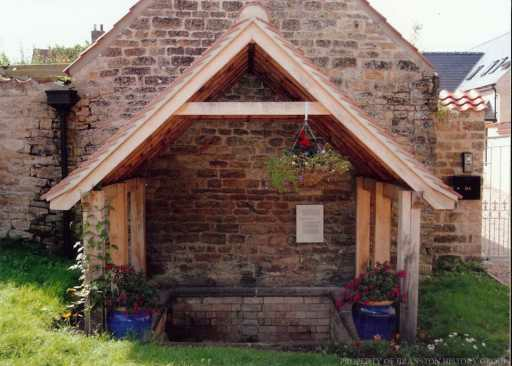 The repairs and restoration of the village pump and the village spring water and reservoir were carried out in 2012 and were managed by the Branston History Group and funded by an award from Lincolnshire Co-operative Society Limited. Most of the restoration work on the waterwheel has been carried out by Mr. & Mrs. Smith of Waterwheel House. Spring water was piped to this location by Alexander Leslie Melville for the use of all the village residents. Water was also supplied to the nearby gasworks which he had built in the 1870s. Gas was supplied to the Hall, to the church for lighting, and eventually to the waterwheel to fuel a gas engine. These gasworks were operational until the 1930s, and until recently water flowed freely into the reservoir via the pipe projecting through the stone wall. The village beck and the local springs were the main sources of water in early times. 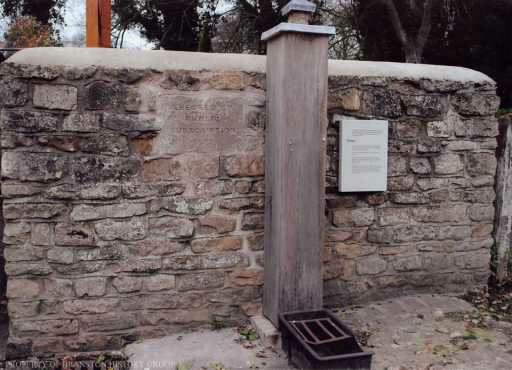 Many wells were sunk between 1700 and 1800, some of which were used communally and some were later fitted with hand pumps. 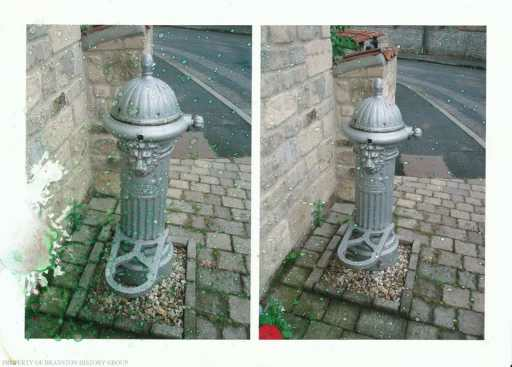 This pump was erected in 1891 for the public use and was paid for by public subscription. The pump is sited directly over a small sump which is continuously fed by a piped spring source. In 1928 it was reported that many wells were contaminated. Mains water was laid throughout the village in 1933. Just 5 of the public âfountainsâ with the lionâs head remain but are no longer connected.